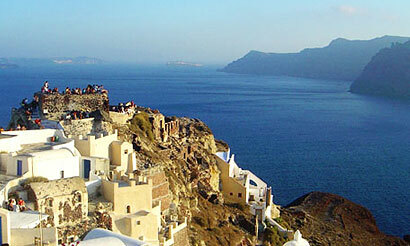 In the Middle Ages, Oia was one of the 'Kastelia' of the island. It was called 'Kasteli' of Agios Nikolaos. The castle's existence was already documented in 1480. Oia suffered harshly in the earthquake of 1956 and much of the traditional settlement tumbled into the sea below the caldera. Resplendent sanctuaries such as the church of Agios Georgios and Panagia of Platsanis were completely destroyed. Nowadays the site of the Kasteli in Oia is a favourite spot for sunset watching.